Don’t sleep on Genesis. Like its parent brand, Hyundai, the marque is continually making strides to establish itself as a bonafide premium automotive juggernaut, and the 2019 Genesis G70 is the latest proof of this. Offered with either a 252-horsepower turbocharged 2.0-liter inline-four or a 365-hp twin-turbocharged 3.3-liter V6 engine (the latter tested here), the rear-drive G70 (all-wheel-drive is a $2,000 option) packs enough power to take on competitors from Audi, BMW, and Mercedes-Benz. While the Genesis name lacks the panache of its European rivals’, the brand makes up for this by way of the G70’s stylish exterior, comfortable cabin, and its long list of standard luxury and convenience features. If the latest Genesis model is anything to go by, then it won’t be long until the Korean brand is as synonymous with luxury vehicles as Kleenex is to tissues. With its 365-hp twin-turbocharged V6 underhood, the Genesis G70 3.3T packs enough power to challenge the likes of the 354-hp Audi S4 and 362-hp Mercedes-AMG C43 for a fraction of the price. At $43,750, the rear-drive G70 3.3T costs thousands less than both $50,000-plus, all-wheel-drive Germans. The six-cylinder G70 is no stripper, either, and it comes standard with niceties such as heated and ventilated power front seats, a power tilt-and-telescoping steering column, a proximity key with push-button start, and an in-dash navigation system. Nevertheless, a trio of available packages load the sports sedan with even more content: The $1,750 Elite package nets a sunroof, front and rear parking sensors, dynamic headlights, rain-sensing windshield wipers, and a wireless charging pad; the $4,250 Prestige package takes all the goodies from the Elite package and adds in a head-up display, surround-view monitor, heated rear seats and suede headliner; and the $5,750 Sport package goes one step further by grouping the items in the Elite and Prestige packages with features such as adaptive dampers, package-specific 19-inch wheels, copper exterior accents, and contrasting red or gray seat stitching. Additionally, the 2019 G70 3.3T is available in two special-edition models: the Dynamic Edition and the Design Edition. Both are limited to a combined 800 units (400 each). The $50,250 Dynamic Edition builds on the content in the Sport package by adding items such as performance brake pads, model-specific tuning for its adaptive suspension system, and a heated steering wheel on all-wheel-drive equipped models. It’s the $48,750 Design Edition, tested here, that truly feels like something special, though. Equipped with the content of the Prestige package, and sporting distinct Black Forest Green paint, dark-green upper dashboard and door panels, and cream-colored leather seats with the Genesis logo embossed in the headrests, the Design Edition combines modern luxury with a hint of old-world charm. With nothing but a $995 destination charge attached to its Monroney, this G70 Design Edition wore an as-tested price of $49,745. The G70 is arguably the most attractive product Genesis currently sells. Its look is bold and athletic, even if some styling elements appear cribbed from competitors (for instance, the window-line is similar to the Acura TLX). Unlike the entry-level four-cylinder G70 2.0T, which comes standard with 18-inch wheels and tires, six-cylinder 3.3T models come equipped with larger 19-inch units. The chunky 10-spoke wheels nicely fill up the wheel wells and manage to look both elegant and sporty. Those in search of even more visual presence can check the option box for the Sport package, which adds dark-colored five-spoke wheels, copper-colored headlight accents, tinted tail lights, and darker chrome trim. 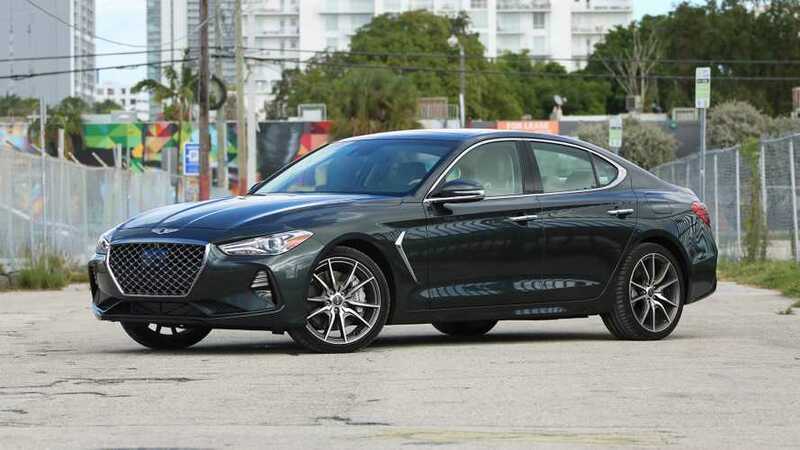 In spite of the G70’s visual presence and generally attractive shape, the sedan isn’t without its design faults and features such as the front fender vents and fence-like grille trim are a tad too tacky for my tastes. Hiding underneath the G70’s low-slung sheet metal is a handsome and ergonomically friendly interior. The driver grips a thick-rimmed three-spoke steering wheel and faces a simple gauge cluster with large analog dials for the tachometer and speedometer sandwiching a 7.0-inch LCD display screen. The dashboard’s center stack includes large and easy-to-operate HVAC controls and an 8.0-inch touchscreen infotainment system. Although the cabin is devoid of wood trim, its sparing use of piano-black surfaces and healthy application of silver and brushed-aluminum trim provide a sense of modern luxury that makes the G70 feel well-worth its asking price. Build quality is impressive, with no offensive panel gaps marring the interior panels, while just about every switch and knob – save for the plastic-y interior door handles – engages with a satisfactory heft. Well-bolstered front seats offer plentiful adjustments and adequate space for long-haul comfort. Limited legroom, however, stymies the three-across rear bench seat. Those who regularly cart more than one passenger will be better served by the Audi S4 or the G70’s mechanically similar sibling, the Kia Stinger, both of which offer 0.9 and 1.6 inches of additional rear-seat legroom, respectively. Nor is the G70’s trunk particularly roomy, and its 10.5 cubic feet of cargo space is down 2.5 cubes to the S4. Meanwhile, the Stinger’s hatchback body style affords it a full 23.3 cubic feet of cargo space with all seats in place. No matter the powertrain, every G70 comes equipped with an 8.0-inch touchscreen infotainment system that’s both Apple CarPlay and Android Auto compatible. The system features clear graphics and logical menu structures. A handful of hard buttons on the center stack offer easy access to functions such as the radio and navigation functions. In fact, the only real knock on the G70’s infotainment setup is its on-screen fonts, which are common to other Hyundai and Kia products. A Genesis-specific typeface and on-screen color scheme would be welcome. In contrast to its cushier G80 and G90 siblings, the G70 is a proper sports sedan. Credit the car’s stiff and playful chassis, which provides the G70 with an engaging and predictable dynamic demeanor, as well as the 3.3T model’s 365-hp twin-turbocharged 3.3-liter V6 that shoots the sedan to 60 miles per hour in a mere 4.5 seconds. The seemingly lag-free engine mates to an astute eight-speed automatic transmission that swaps cogs with unobtrusive authority – there’s never a moment the G70 feels lacking for oomph. Those looking for additional driving engagement can tap at the steering wheel-mounted paddle shifters to manually change gears (or just grab the available six-speed manual, although that requires a downgrade to the base turbocharged, 2.0-liter engine). Thanks to its sticky summer tires, the G70 Design Edition takes to turns like Popeye to spinach. Well-weighted – albeit rather numb – steering, a firm left pedal that connects to beefy Brembo brakes, and a stiff suspension provides the sedan with the necessary tools to give the driver a sense of engagement and control during more dynamic driving. There is a tradeoff to this, though, and the G70’s rigid ride makes it a less than ideal companion on rougher roads. Although it won’t rattle any teeth, the G70’s ride quality caters more toward sport than comfort. Every G70 comes standard with active safety items such as forward-collision warning with pedestrian detection, adaptive cruise control, lane-keep assist, automatic high-beam headlights, and a blind-spot monitoring system with rear-cross-traffic alert. While the safety systems in the entry-level Genesis fail to clear the high bar set by the semi-autonomous driving aids offered by competitors such as Mercedes and Volvo, the G70’s safety kit is perfectly adequate for the class. The fact Genesis doesn’t charge consumers to add active safety items to the G70 is extra icing on the cake. With great power comes an unquenchable thirst for fuel, and the Genesis G70 3.3T sips premium gasoline like a drunk downs Dewar’s. The EPA rates the model at 18 MPG city, 26 MPG highway, and 21 MPG combined. Adding all-wheel-drive lowers the car’s highway and combined fuel economy figures to 25 and 20 MPG. Comparatively, both the six-cylinder all-wheel-drive Audi S4 and Mercedes-AMG C43 earn ratings of 21/30/24 and 19/27/22, respectively. The less powerful G70 2.0T manages figures as high as 22/30/25 when equipped with rear-wheel-drive and an eight-speed automatic transmission.